CSS: Sass to CSS conversion, error catching, Auto Prefixing, Sourcemaps, CSS minification, and Merge Media Queries. Generates .pot file for i18n and l10n. Read the following methods to find out more about WPGulp. 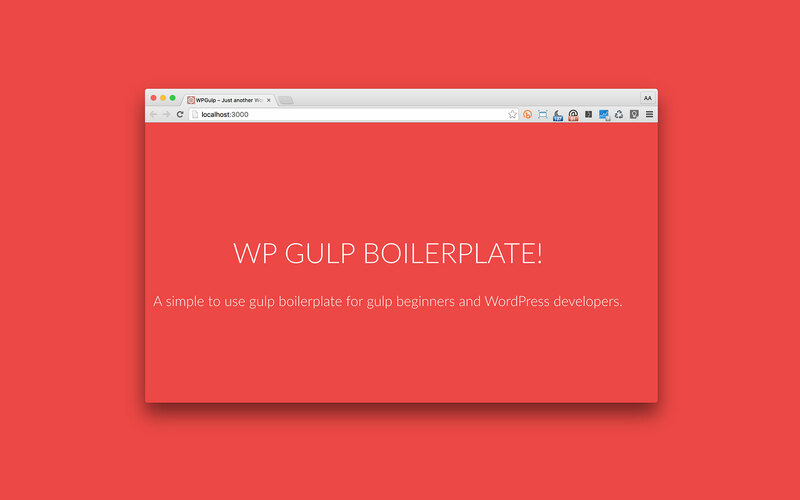 Checkout a basic WordPress theme implementation with WPGulp called WPGulpTheme. Open the project folder in the terminal and type sudo npm install wait for the files to get downloaded. It will take about 2 minutes to add a node_modules folder inside your project. Once the download is complete type gulp and boom! Tested and built on Mac OS Yosemite. You must have Git and Node, NPM, Gulp installed globally. You should never commit node_modules folder, you should exclude it in .gitignore file. Delete old ones and download the latest gulpfile.js and package.json files in the root of your WP project.